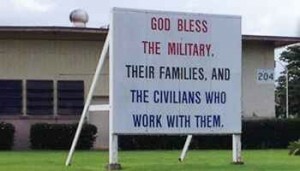 KANEOHE, Hawaii — A group that seeks to separate God from the military is demanding the relocation or removal of a sign at a Marine base in Hawaii that asks God’s blessing on the Armed Forces. The Military Religious Freedom Foundation (MRFF) sent an email this week to Col. Sean Killeen, the commanding officer of Marine Corps Base Hawaii, to take issue with a sign near the marina that reads, “God bless the military, their families, and the civilians who work with them.” It was reportedly erected following the September 11th attack of 2001. Blake Page of MRFF asserts that the sign is a violation of the Establishment Clause of the U.S. Constitution, which reads, “Congress shall make no law respecting the establishment of religion or prohibiting the free exercise thereof.” He is demanding that the sign either be moved to the chapel or removed altogether. Capt. Timothy Irish told the Marine Corps Times that the matter is currently under review. But retired Chaplain (COL) Ron Crews, who now serves as the executive director of Chaplain Alliance for Religious Liberty, says that MRFF is misinterpreting the Constitution as it does not require that government refrain from ever mentioning God.